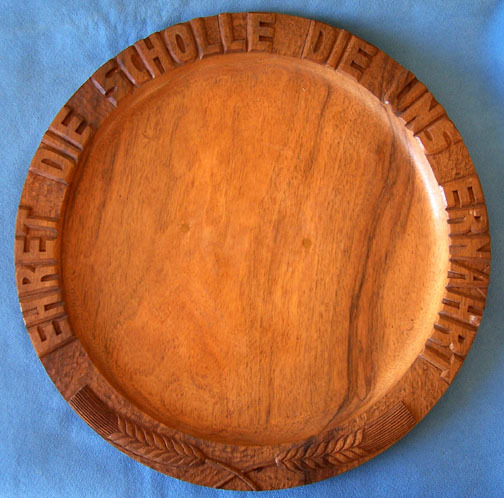 Here we have a wooden “Himmler Presentation Plate” that has been recently carved by a German, one Torsten Belger, for the pleasure of collectors and the enrichment of crooked dealers and auctioneers. In quality, this is a much better modern production item than the very crude, mismatched “Himmler Chairs” produced for an American dealer. And then there is the awful “SS Paratrooper badge” which we will cover in our next newsletter. Sir: These plates, and some boxes, are now being sold for large amounts of money by German and American dealers. I think I have seen this plate on an Alexander auction company. They have very stupid fakes most of the time such as a huge pair of undershorts they say belonged to Hitler. So big as to be obvious. I will get you more pictures of the SS plates and you can have them to use. And what about that huge carved Himmler chair that stupid person in Georgia is trying to sell? These swindlers and liars are selling things only a fool would buy. In my opinion, this whole collecting business is a water hole for flat nuts. I have run into some of the dealers and they are very ignorant, nasty and opinionated. This WAF sounds like a group therapy session for small children. Like the dealers, the members are ignorant, nasty and opinionated. Most original items are in private collections so why do dealers have laundry baskets full of daggers, hats, medals? They find huge stashes under some Polish barn a week ago? They always say they got their fakes from a vet. What? Someone who medicates animals? Who was the vet? You ask that question and the dealer sneers at you as do the WAF fools. They deserve what they are getting.